'MARJA, AFGHANISTAN' for Time Magazine: U.S. Marines clear an area for bombs in Marja District, Helmand Province, Afghanistan. 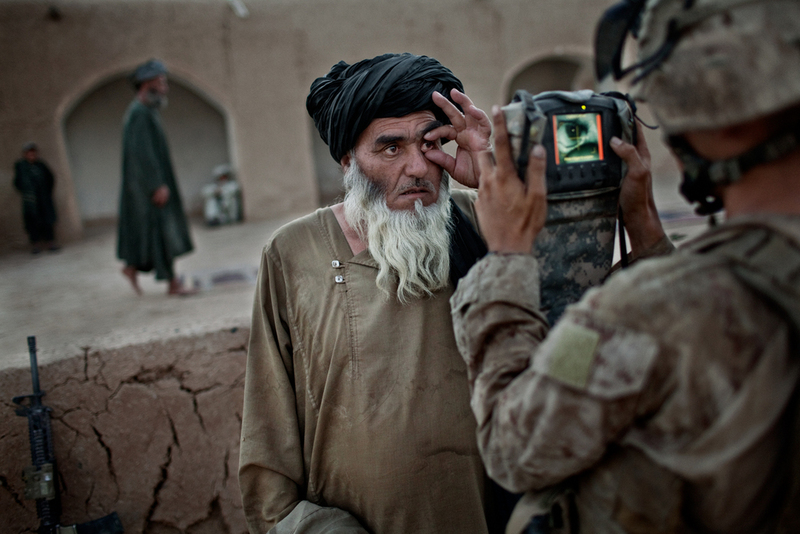 A U.S. Marine records the biometric data of an Afghan villager at a mosque in Marja District, Helmand Province, Afghanistan. U.S. Marines prepare to depart Combat Operations Post Coutu for a patrol in Marja District, Helmand Province, Afghanistan. U.S. Marines come under attack while on patrol as part of a joint operation with British forces in Marja District, Helmand Province, Afghanistan. U.S. Marine Lance Corporal Nicholas Edwards stands guard over Afghan farmers harvesting opium inside Combat Operations Post Coutu in Marja District, Helmand Province, Afghanistan. A U.S. Marine flare marks a landing zone for a medical evacuation helicopter near Patrol Base Beatley in Marja District, Helmand Province, Afghanistan. U.S. Marine Lieutenant Kevin Gaughan meets family members of Gulmakay, a fourteen-year old Afghan girl killed by a U.S. Marines mortar strike, in Abdullah Jan Village, Marja District, Helmand Province, Afghanistan. Family members of Gulmakay, a fourteen-year old Afghan girl killed by a U.S. Marines mortar strike, carry her body after presenting it to Marines in Abdullah Jan Village, Marja District, Helmand Province, Afghanistan. 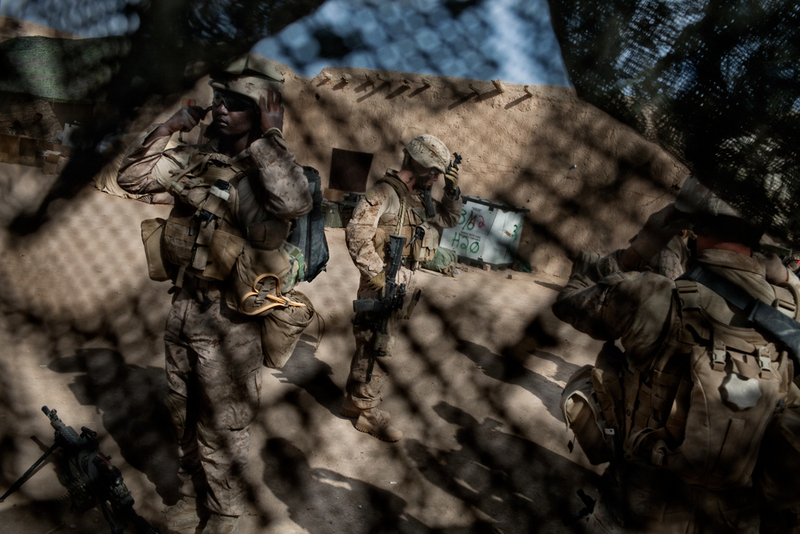 U.S. Marines rest at Combat Operations Post Coutu before a patrol in Marja District, Helmand Province, Afghanistan. 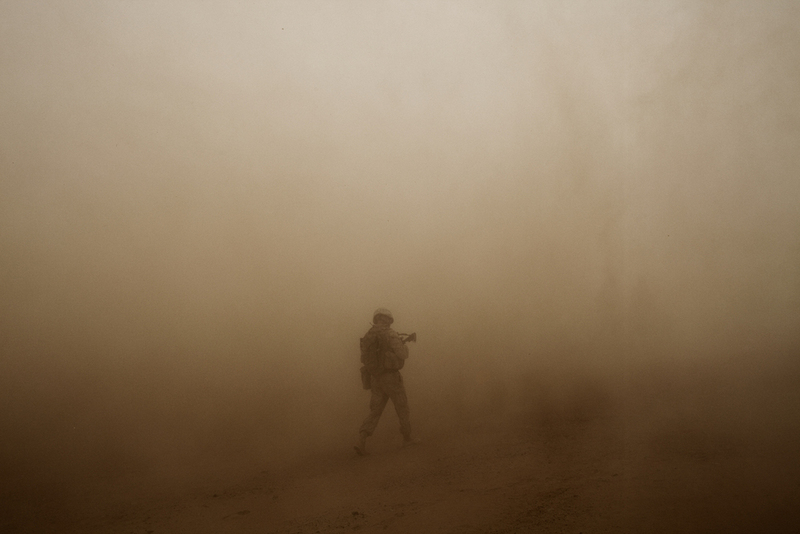 A U.S. Marine walks in the dusty rotor wash of a helicopter in Marja District, Helmand Province, Afghanistan.